hi obachan, that looks totally awesome - the morsels of meat look so juicy, tender and succulent. sadly, chima sanchu is not readily available here; do you think shiso would work as a substitute wrapper? I guess some people do wrap yakiniku with shiso leaves here. Personally, I can’t eat much of raw shiso leaves because they are a bit too strong for me. So when I do eat them raw, I need to cut them into real thin strips and use a small amount as a condiment. (But I love shiso so much when deep-fried with meat, fish, or as-is. That way I can eat a lot of them.) Also, lettuce is commonly used as yakiniku-wrapper here. 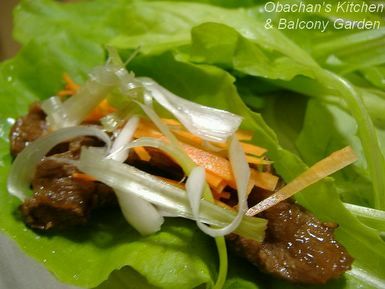 Actually I’m thinking about trying lettuce & shiso combination next time -- using lettuce as a main wrapper and putting a little shiso strips inside with meat.